Frugal Mom and Wife: 3 Free Natural Style Hair Care By FUBU Samples! Free Shipping Too! 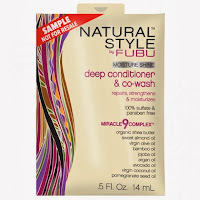 3 Free Natural Style Hair Care By FUBU Samples! Free Shipping Too! Simply follow the link below and add whichever samples you'd like to your cart. You can choose from Deep Conditioner & Co-Wash; Curl Elongator; Curl-Defining Gel. Proceed to checkout where you will verify your sample request. No CC required. Fill out your shipping information and submit.